George Clooney made Matt Damon believe he had got fat by stitching his pants up during filming. 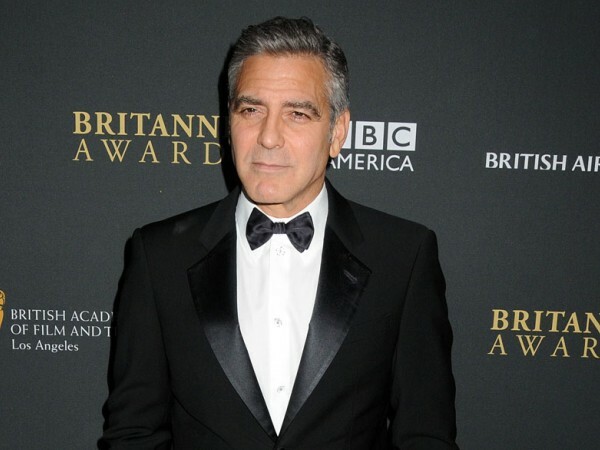 George Clooney made Matt Damon believe he had got fat. The 43-year-old actor admits his Monuments Men co-star stitched his pants during filming to make him think he was gaining weight, but he didn't realise he was being pranked until the movie had wrapped up. Matt explained on The Tonight Show With Jay Leno, "I read, finally, which answered a lot for me that he'd been taking my wardrobe in, my pants in by about an eighth or a sixteenth of an inch, like every couple of days. He said, 'Oh we're going to get in shape', and I said, 'Yeah we're going to get in shape', so I was working out and my pants [were getting tighter] and I was thinking, 'This just can't be'. I never said anything to him which, of course, he probably loved even more." However, this isn't the first time Damon thought he had fallen victim to the 52-year-old's practical jokes until he realised that he had actually been piling on the pounds. He said last year, "A couple of years ago I hadn't been working out and I'd got kind of fat. I had to go to a function and when I tried on my suit, it was too tight. My immediate thought was that my buddy George Clooney had hired someone to get into my closet and cut down my clothes. I seriously thought that - until my wife said, very gently, said 'Do you think it might be that you've put on some weight?' "
Meanwhile, Clooney admitted in November that his favourite practical joke involves sending his co-stars into a panicked dieting frenzy by having their clothes altered so they no longer fit.